The Ergo-Line hand crank vertical adjustablility reduces repetitive motion injury and increases productivity. Push button electric and tilting available upon request. Custom units utilized as parts feeder to eliminate back fatigue from bending. Call for details. Ergonomists at the world's largest manufacturers have recognized that repetitive motion injury (RMI) can be greatly reduced and productivity greatly increased by changing the positions during the work process. 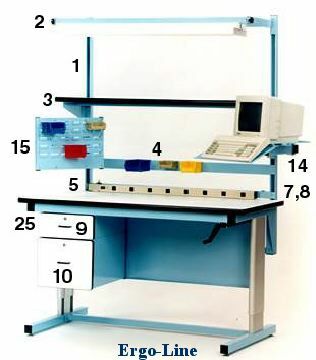 The Ergo-Line workbench allows operators of all sizes and physical characteristics to change work surface height at will. Our optional Work Surface tilting feature is available upon request. Ergo-Line Work benches have a 330 lb. capacity. 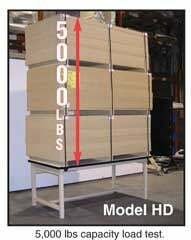 For other height and weight requirements see the Model ELH, Ergo-Line HD (750 lbs. capacity). 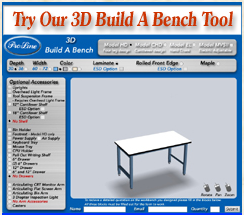 Click on the optional accessories below; to see the modular accessories available for this height adjustable workbench. Note: The illustration includes Optional Accessories: #1, 2, 3, 4, 5, 7, 8, 9, 10, 14, 15, and 25. More items are present in our Newest Catalog. Get your copy today. Order Electric Hydraulic Push Button Height Adjustment for your Ergo-Line Workstation. The Stock Number Prefix changes to "ELE" Call for pricing. 48"L x 30"W x Hand Crank Height 30" to 42"
48"L x 36"W x Hand Crank Height 30" to 42"
60"L x 30"W x Hand Crank Height 30" to 42"
60"L x 36"W x Hand Crank Height 30" to 42"
72"L x 30"W x Hand Crank Height 30" to 42"
72"L x 36"W x Hand Crank Height 30" to 42"
See our in stock bench casters for the Ergo-Line.